You can add complex elements elements, choose additional controls, and change parameter values when configuring sections in App Studio. 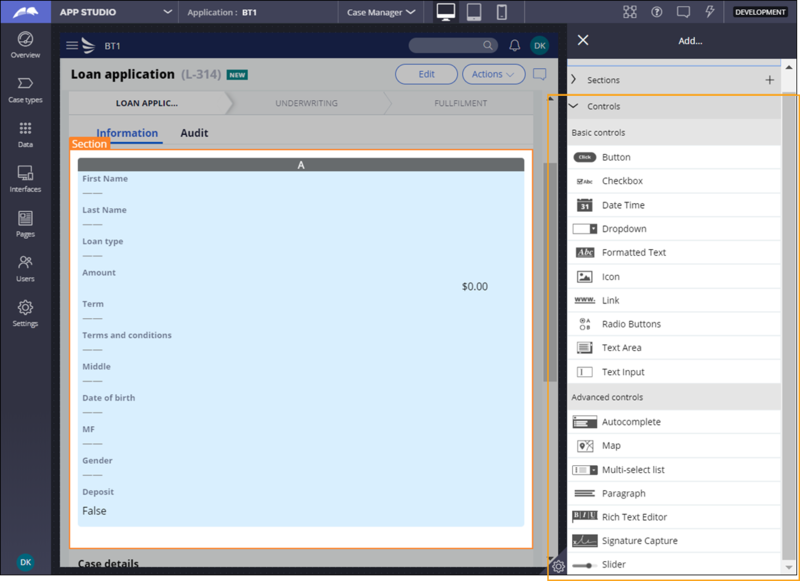 If you have access to Dev Studio, you also have access to the complete property panel for controls in App Studio. 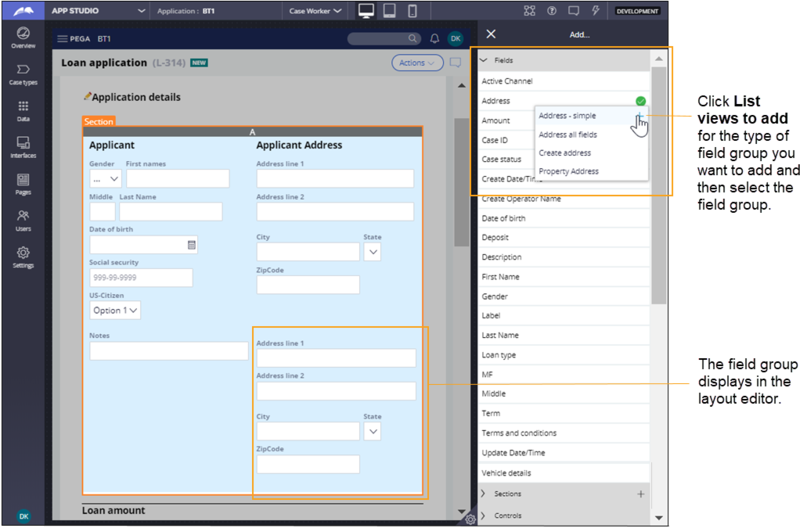 The more robust set of options enables you to quickly modify the user experience at run time without having to switch to Dev Studio to modify sections. You can add complex elements, such as sections, field groups, and data references to sections at run time. 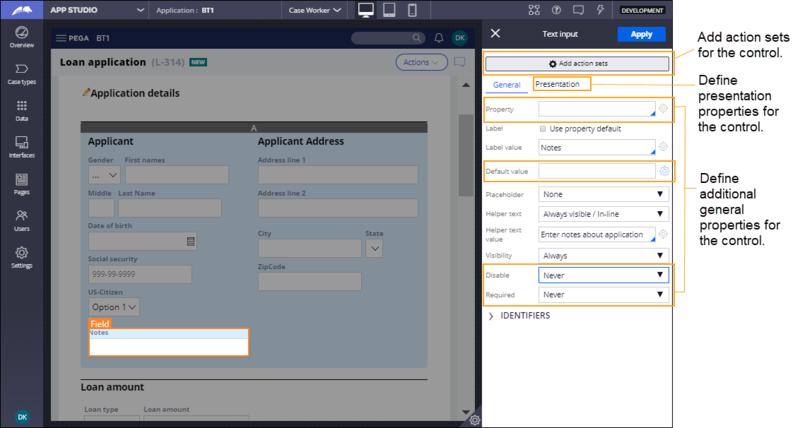 For example, to capture a loan applicant's work address on an application form at run time, you add the Address-simple field group to the section that collects the applicant's home address. More controls are available for you to include in sections when you modify forms in App Studio. Autocomplete – Use the autocomplete control when users need to select a value from a large set of searched text values, based on a partial string match. Map – Add the map control when users need to view and interact with location points in Google Maps from within the desktop or mobile app. Multi-select list – Use the multiselect list control when users need to select multiple items for a single field. Signature Capture – Use the signature capture control when users need to provide a signature, either through mouse input or through a touch interaction on a mobile device. Slider – Add the slider control when users need to select a value from a scale, such as a value from 1 to 10. The following figure illustrates the controls that you can add to sections in App Studio. 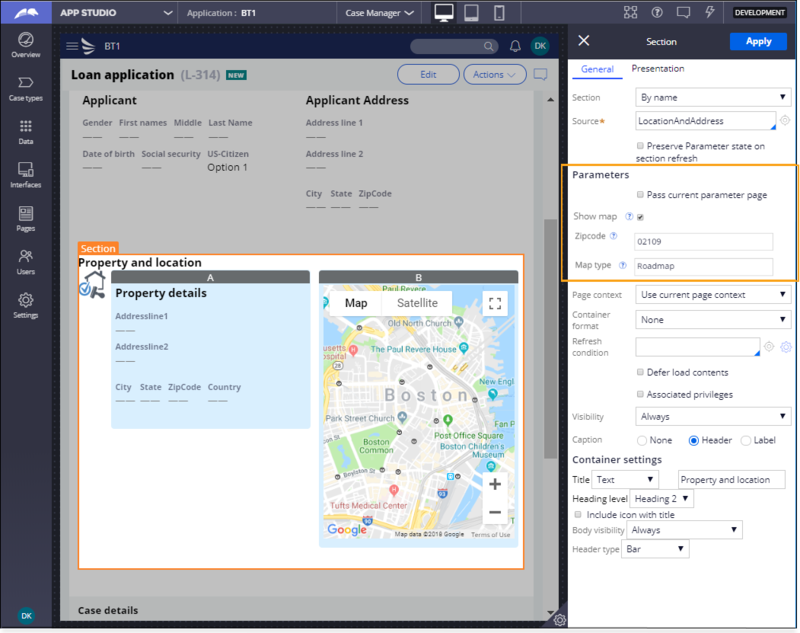 If you have access to both App Studio and Dev Studio, you can also access the full set of properties for controls in App Studio. Define additional general properties – Set additional general options for a control. For example, you can select a property reference that identifies a single value for a text input control. Define presentation properties – Set advanced presentation options for a control. For example, you can define the minimum and maximum characters allowed for text input control. Add action sets – Pair events with actions to determine the behavior of a control. For example, you can specify that clicking a button refreshes a section. The following figure illustrates the full property panel for a text input control in App Studio. You can change parameter values at run time in App Studio. For example, you create parameters for a section that displays a terrain map based on a customer’s home ZIP code. For one customer, however, you change the parameters at run time to display a roadmap based on their work ZIP code. The following figure illustrates changing parameter values for a map. For more information about modifying sections at run time, see Configuring a form at run time. For more information about including controls in sections, see Controls. For more information about action sets, see Adding actions to a control.